Make healthy choices with the Napoleon Healthy Choice Starter Kit. 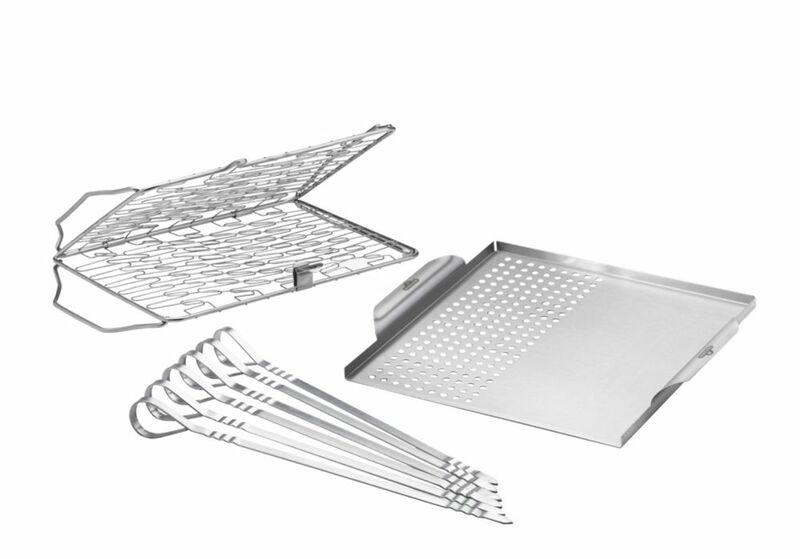 The Stainless Steel Multifunctional Topper features two different sides, the perforated side is ideal for grilling veggies, while the flat side is perfect for searing delicate foods. The reusable Stainless Steel skewers allow you to create custom kebabs with any vegetables or protein you wish. Raise delicate foods with the Flexible Grill Basket. Built for our Rogue Series Gas Grills, this heavy-duty kit easily accommodates up to 26.5 lbs. of food, and fits barbecues up to 25-inches wide. Add the included counter balance to ensure smooth rotation. Add the included counter balance to ensure smooth rotation. The food grade stainless steel spit rod cleans easily with some soapy water, and forks can go into the dishwasher. Healthy Choice BBQ Starter Kit Make healthy choices with the Napoleon Healthy Choice Starter Kit. The Stainless Steel Multifunctional Topper features two different sides, the perforated side is ideal for grilling veggies, while the flat side is perfect for searing delicate foods. The reusable Stainless Steel skewers allow you to create custom kebabs with any vegetables or protein you wish. Raise delicate foods with the Flexible Grill Basket.